Pro Shop Hours are subject to change depending on activities at DeKalb Tennis Center. Outside of Pro Shop hours, please email info@agapetennisacademy.com for any questions, concerns, court reservations, registering for drills, etc. Players must sign in at the front desk before going to the courts. 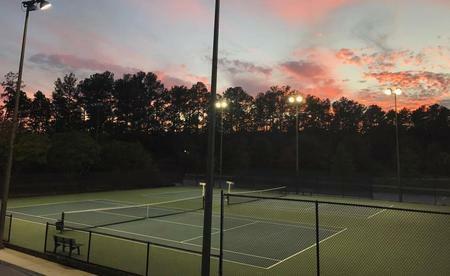 DeKalb Tennis Center is a premier public tennis facility located in Decatur, Georgia. DeKalb Tennis Center is renowned in the state of Georgia due to its hosting of numerous large scale tournaments, socials, and events, including several ALTA (Atlanta Lawn Tennis Association) City Championships each year. DeKalb Tennis Center is known for its pyramid-shaped facility with a full scale pro shop sitting at the peak. The center offers 17 hard, lighted tennis courts, a full scale pro shop with re-stringing, equipment, café with espresso drinks, snacks, and other beverages, Wi-Fi and other tennis necessities. DTC is managed by Agape Tennis Academy, that offers programming for all ages and ability levels, including group classes, team coaching, private lessons, socials, round robins, and other fun events. DTC is also host to numerous ALTA and USTA team’s year round. Come check out DeKalb Tennis Center today and enjoy our inclusive, family- friendly facility and our first class programming.